If you read our post on cooking a turkey in the dishwasher and you tried it, we have a second cooking adventure for you: A Lasagna! Cut three 24-inch x 12-inch sheets of aluminum foil and lie flat. Take first lasagna sheet and place flat it in the center of the aluminum foil. Spread a thick layer of pasta sauce over the sheet, covering the entire surface. In a bowl, mix the ricotta cheese and spinach and layer half the mixture on top of the tomato sauce. Layer desired amount of grated cheese, along with fine herbs, garlic, and onion flakes. Top with second lasagna sheet and repeat all layers. Cut third lasagna sheet into strips about 3/8-inch wide and layer on top of lasagna in a criss cross fashion. Top with herbs and spices. Wrap lasagna tightly in the foil by taking the longest sides of the foil and bringing them to meet above the lasagna. Fold the edges of the foil together to make a ‘paper bag’ effect (like that you would when folding a brown paper lunch bag)above the lasagna. Begin to fold the edges together downward until you are just above the lasagna. Flatten the foil out above the lasagna and fold in the remaining sides like a present, first the sides, then the middle. 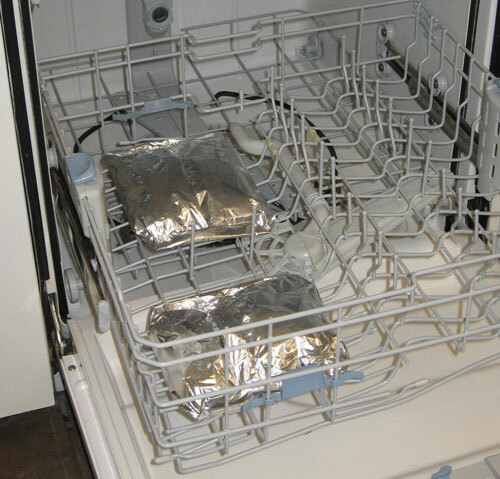 Place the wrapped lasagna flat in your dishwasher on the bottom rack. 12. Set dishwasher to normal cycle and select ‘heated dry’ and ‘sanitize; settings for maximum heat. 13.Wait for the cycle to complete, then carefully remove lasagna from foil and let stand for a few minutes before serving. Pete ran into a couple glitches, let us know how yours turns out!